Choosing my second Whisky of the Month was a no-brainer. It simply had to be The Balvenie Tun 1401 Batch 5. David Stewart, Malt Master, has been with William Grant & Sons for half a century this year and has fulfilled the role of The Balvenie’s Malt Master since 1974, hand crafting their whiskies. That’s as long as I have been on the planet! One can only marvel at the depth of experience that 50 years of working with whisky can bring. You just know that this man knows how to create great whisky and based on the few “standard” expressions of The Balvenie that I have tasted and thoroughly enjoyed (the 12, 15 and 21 year olds) I can only imagine how great the Tun 1401 batch 5 must be. Nose: Upon pouring, a profusion of fragrant fruit is brought to the nose before sweet vanilla emerges alongside honey and spices. Taste: The taste is a velvety smooth balance between sweetness and oak tannin, underpinned by a sherried character full of dried fruits and a cinnamon and ginger spiciness. Finish: The finish is rich, sweet and spicy. WTF: The Tun 1401 series has been incredibly successful, can you fill us in on how the idea originated? DS: We are very fortunate to have such a wealth of aged casks, which is down to us being a family company and not being pressurised into using our stock but just letting them mature on for further opportunities at a later date. We were looking for an innovative way of using some of these aged Balvenie casks in small batches and we decided to use one of our marrying tuns as the holding vessel. It is very unusual in the Scotch Whisky Industry to use casks in a vatting with such a wide age span so this is what we decided to do. I would first experiment with different formulas in our sample room, which I have done for each batch and in each case trying to make each batch nose and taste different using different ages and different percentages of American and European oak casks. These small releases to different parts of the world have been very successful and have provoked a number of debates on their different styles from batch to batch. WTF: Can you please give us a breakdown of the whiskies used in this release – casks and vintages? DS – Sorry, I didn’t keep nose and taste notes for each individual cask but obviously I did sample many individual casks prior to selecting which ones to use in each batch. WTF: David, did you have a specific flavour profile in mind when creating this batch? How different is it from the previous ones? DS: Not really, I just wanted to create a stunning Balvenie each time, some with more of the American style i.e. soft fruits, citrus and vanilla and others more complex using more of the European oak resulting in a more spicy flavour with dried fruits – raisins, sultanas and dates etc. WTF: Andrew, you mentioned on Twitter that Batch 5 has a long finish (“I finished drinking that new #Balvenie #Tun1401 Batch 5 ten minutes ago and I can still taste it. Now that’s what I call a long finish”) – care to elaborate? AF: I really could still taste it 10 minutes after taking my first sip! It leaves a sweet honeyed taste at the front of the tongue. The whisky is viscous and slightly syrupy – it coated the inside of my mouth and gums. WTF: Does the Tun itself in any way influence the flavour of the final product? Is there any wood interaction? WTF: Are you still manually pumping the casks into Tun 1401? AF: Yes. David has got an old hand pump hidden away in Warehouse 24 which must date back to Victorian days. Chances are that William Grant himself would have used this to empty casks! WTF: Will Tun 1401 be retired and replaced any time soon? AF: There are no plans to retire Tun1401 at present. However there is only a limited amount of this rare and old stock in the warehouses. When it is gone it is gone. WTF: Batch 4 was released just a few months ago in travel retail, when and where will Batch 5 be available? Worldwide or just Europe? WTF: Do you see the series continuing, i.e. batch 6, 7, 8 onwards? AF: I hope so. We still have stocks of old and rare casks hidden away at the distillery but it is up to David Stewart as to what they are used for. Who knows what he will decide to do next?! WTF: Thank you David & Andrew for your time and thoughts, and Kirsty Chant for co-ordinating everything. Much appreciated everyone! 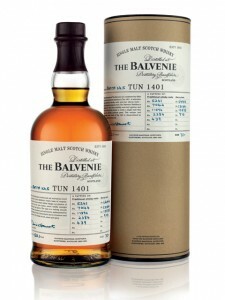 There is a very good chance that by the time you read this post The Balvenie Tun 1405 Batch 5 will be sold out already. 2,862 bottles were released at the end of June and you can be sure that they won’t hang around on the shelves for very long. Take heart though if you don’t get a bottle this time around as I’m sure we’ll see another release in this classic series. At least I hope so!